These two teams have been having very different season, with the one thing they both have in common is ups and downs throughout their campaign. The Cubs have won thirty seven and lost thirty thirty four out of their seventy two games in 2017, for a winning percentage of .514 that has them as the second placed team in the central division of the National League, a game and a half behind the Milwaukee Brewers in first place and three and a half games ahead of the St. Louis Cardinals in third and four and a half games ahead of the Pittsburgh Pirates. 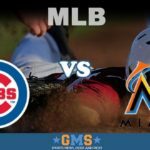 They visit the Marlins at Marlins Park with an away record that has been bad, having won fifteen of the thirty four games they have played away from home, for a .441 winning percentage when playing away from their home crowd. The Marlins have won thirty two and lost thirty nine of their seventy one games in 2017, for a winning percentage of .451 that has in them in third place of the eastern division of the National League, ten games and a half games behind the Washington Nationals, but only a game and a half away from the Atlanta Braves in second place. They have to receive the Cubs with a home record that has been pretty OK, where they have won eighteen of the thirty six games they have played on the road, for a .500 winning percentage when playing in front of their fans. Both teams are coming into this game with similar but also different recent forms, with the Cubs winning their last game, but have been able to win six and lost four of their last ten games. The Marlins, on their part, have lost their last game, but have only been able to win five and lost the other five of their last ten games. Jon Lester will be the starting pitcher for the Cubs in this game and it will be his sixteenth start of 2017. In his previous games, he was only able to get four wins, while losing four and leaving seven games undecided. He has pitched 89.1 innings, allowing 86 hits, 42 runs and 11 home runs, accumulating an earned run average of 3.83 while striking out 93 players. The starting pitcher for the Miami Marlins will be Justin Nicolino and the twenty 25 year old is looking at only his fifth start this year in this games. In his previous starts, he lost one and was not decisive in the other three, pitching only 16 innings, giving away 20 hits, 12 runs and 4 home runs, while also getting 10 strikeouts and an earned run average of 5.06, nothing to show off.